Bringing some of America’s greatest stars to your ears with humor and fun! Take a journey with The Swan as he brings to life some of our greatest stars of movie and TV. 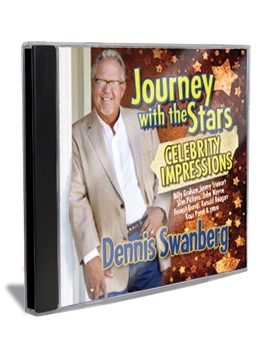 Dennis Swanberg will have you laughing and crying through his impersonations of Billy Graham, Jimmy Stewart, John Wayne, Forest Gump, Ronald Reagan and more. Journey with the Stars is great to listen to in the car and a wonderful Christmas gift!